Do you have a spare pump in case of failure? Given the significance of the oil and gas industry in Australia, if an operation had to shut down production due to a faulty pump, it would be a major problem. Having a tailor-made spare pump on hand is essential to avoid costly downtime. Here, we clear up common misconceptions about spare pumps and what you should consider when buying a spare for your system. As the cost of downtime for oil and gas operations in Australia is extremely high it’s crucial that backup plans are in place should a failure occur. Oil and gas pump components are generally specialised and consist of exotic materials, so any generic pump won’t cut it. These components are also associated with higher costs and longer lead times for delivery. Brian Dixon, Oil and Gas Sales and Business Development, Sterling Pumps, said it’s therefore extremely important that if equipment is critical to operation, it needs to have an appropriate backup. “There is generally a long lead time to manufacture oil and gas pumps, so if there’s an emergency breakdown, with no spare ready, production could halt for 8-12 weeks while a new pump is manufactured,” Mr Dixon said. Sterling Pumps supply standard and tailor-made submersible pumps to oil and gas installations in many regions, including Wheatstone and Gorgon, and specialise in super duplex stainless steel pumps. “It’s very important that the criticality of each piece of equipment is identified,” Mr Dixon said. “Ask what is the cost of the equipment in question, how long does it take to replace and what would the cost be if this equipment failed. From this, it becomes obvious which equipment requires an onsite spare. “If a pump is only used once, a few times a year, it would have a low criticality and you would have time to get a new replacement pump if it fails. “But if it’s something that’s pumping 24 hours a day, 7 days a week, you can’t afford for it to fail and be left without a replacement. Mr Dixon said that spare pumps are not only essential for new projects, but existing installations should also assess their redundancy plans. 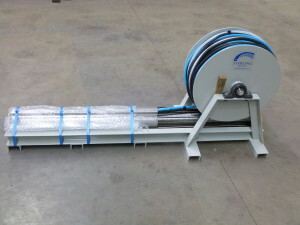 “A major consideration involves making sure the spare is a perfect fit for the specific application and system. There’s no point in having a spare generic pump if it’s not exactly what is needed,” Mr Dixon said. Besides a range of standard pump products across oil and gas, irrigation, mining and fire, Sterling Pumps also manufacture specially engineered products, purpose built for the job at hand, which means they can make an exact replacement of the pump currently in place. “Yes, we do stock standard pumps across industries, but all of our oil and gas pumps are made to order,” Mr Dixon said. “It’s one of our advantages because we’re not just mass producing one product, regardless of the application, we’re actually tailor-making pumps to suit the exact production needs. “Given the huge variation in pump models and materials, it’s not practical for pump companies to stock the relevant parts for a breakdown situation. Mr Dixon said Sterling supplied two major service water pumps to an offshore platform. Both submersible motors were damaged by a lightning strike during a storm. “The platform was new and about to go online when a lightning strike blew a hole through the two motors, destroying them. “Lightning is very common when you’ve got a steel structure sitting 30 meters in the air with no land around it. In this instance their lightning mitigation efforts failed to protect the motors and they didn’t have a spare in place, which meant the start of operations would be delayed. “We were able to provide them with two super duplex stainless steel motors to pump the seawater and ensure the platform went online,” Mr Dixon said. Mr Dixon said it’s a possibility that some pumps won’t take well to sitting in storage for years, but spares can also be used while the main pump undergoes maintenance. “If you build a new platform with new pumps, the idea is for them to last around 25 years, but that’s only if they’re serviced and maintained. “A spare pump can go in when the other one is serviced, and while they’re in storage all that really needs to be done to keep them in good condition would be to rotate the component by hand and turn the pump over so the bearing and seals don’t bond,” Mr Dixon said. 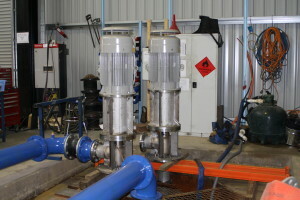 For some operators, spending money on backup equipment might seem unnecessary if primary pumps are serviced regularly. However, Mr Dixon said that having the correct spare pump in place is a practice that must occur in all oil and gas operations. “Consider what the cost of having a pump fail would be on production. I know some offshore platforms that have functions which can stop the operation from producing oil if they fail, which could cost many thousands of dollars a day, for every day it’s not replaced. “Once we know which equipment is the most important, Sterling can size, manufacture and deliver the right pump for that application and operations can have confidence in continued production,” Mr Dixon said.